Wiarton Airport lies on the edge of Colpoy Bay in the Bruce Peninsula of Ontario and is just a short bicycle ride from the town itself (during the summer, free loaner bikes are provided for pilots to explore the area). I was told that Grey county gets it's name from the inclement weather here in the winter, but It was originally an emergency alternate for Pearson International and as a result still has an ILS approach as well as a full-time weather office which is incredible given the relatively light use of this airfield. The operators are a great bunch of guys who like to make sure the locals are well-aware of the economic significance their airport makes to the area and pilots who arrive on a slow day are afforded the luxury of a loaner station wagon which prominently displays in the window a sign telling everyone who sees it, that this is another person who has been delivered to their town via the airport. The last time I visited, the car was not available (someone beat me to it) but a very kind fellow pilot who was on his way out for a ride in his plane graciously offered his Mercedes to my uncle (arguably one of Hollands older pilots at 80) and I so that we could go into town for what turned out to be one of the best homemade hamburgers I've had in a long time. There's also an excellent hotel called the Waterview just five minutes walking from the airport and if you mention you flew in, they'll give you a 10% discount on an already reasonable rate. Private beach, nice inground swimming pool and campfires every night in the summer. The Wiarton Courtesy Car. This is the kind of thing that every small airport in Canada should offer to their fly-in aviators. 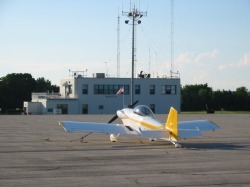 Wiarton airport lies on the edge of Colpoy Bay and is a short bicycle ride into town. My candidate airport to host the Canadian equivalent of Oshkosh-let me know what you think. I think the field would make an excellent location for the recently homeless Canadian Air and Space museum. One of the islands at the entrance to the bay was once a private game reserve for GM bigwigs who used to fly executives in from all over the world for corporate hunting outings (they maintained a small farm to stock it). Of course, with the comings and goings of aircraft arriving from around the world at odd hours, local rumours inevitably spread and fearing bad PR, GM eventually sold the property. It's now owned by private interests and still operated as a private game preserve. The island even has it's own private runway which unfortunately had experienced a tragic crash of a lightplane killing all three on board when it landed short of the island the week I was there. An F-18 made a stop at Goderich over the long weekend (just to the right of the building) May 23/2010 See more photos under my F-18 page. With a week of holidays for my son and I while we waited for my wife's holidays to start, I decided to take my son for his first plane ride in dad's RV4. Although he had been up previously in a light plane, I figured he needed to wait until he was a little bigger to ride shotgun in the RV since the passenger sits behind me and I cannot help him if needed mid-flight as was the case previously in friend Randy's four-seater when Erik decided at 7,000 feet and 20 minutes from landing that he had to pee really bad. The relatively roomy backseat of Randy's Piper and the fact that I could assist with a steel thermos, astronaut-style, saved the day in that instance. 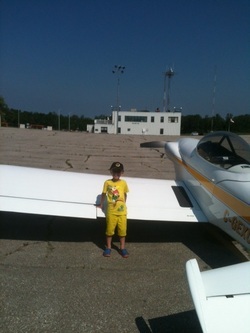 Wiarton is close enough to be a tolerable ride for a five year old although the headset proved to be a little to tight on Erik's head-something which did not make itself apparent until we were still ten miles from landing. Wiarton airport is now operated by a company with headquarters in the Arab Emirates, a fact which apparently is not nearly as upsetting to Canadians as it is to Americans when Arab countries control their ports. At any rate, the new airport manager, Ken Hamilton and operations manager Melissa Swain met us at the terminal and graciously offered the airport car. Melissa used to be an air traffic controller at Toronto's island airport and has moved back to Wiarton with her family to hopefully keep the airport open to general aviation despite a seemingly insurmountable financial problem. It seems that the airport and it's runway and lighting are in need of significant upgrades to the tune of 4 million dollars according to an audit by Transport Canada. The stumbling block seems to be a result of dual ownership of the airport by two municipalities, South Bruce township and Georgian Bluffs. While Georgian Blluffs wants to make the improvements and has even offered a reasonable offer to compensate South Bruce if they were to leave the "marriage." South Bruce neither wants out, nor do they want to contribute. Unfortunately, Wiarton Keppel airport is the unfortunate child caught in the middle and no intelligent investor will come to the rescue until there is a resolution to this problem. There is a wonderful hotel a stone's throw to the airport called the Waterview, which has been in operation since the 1950's in one form or another and on this trip, that's where Erik and I headed. With a great inground pool, private beach and nightly campfires put on by the owners, it is an obvious choice for a five year old during the hottest week of the summer. Pilots get a 10% discount when they advise the owners they came via the airport. Joint ownership of the airport was taken over by Georgian Bluffs so presumably development plans or at least maintenance of the status quo will be easier moving forward than it was in the past. Sadly, the new management did away with the free bicycles and courtesy car that were one of the reasons I would sometimes fly in to here-and I'm sure others as well. The new airport manager is Gaurav Sharma and hopefully he is able to find new ways to make this field an attractive destination-I don't think the numbers swill support regular scheduled flights in and out of here; on the beautiful summer day I flew in, I don't think any other aircraft landed here. The Waterview is also under new management and no longer offers the 10% discount for fly in pilots either.